King Cnut (1016-1035) and Queen Aelfgifu (also called Emma) gave a large jewelled golden cross to the New Minster. At the beginning of the Liber Vitae, a picture shows the royal couple's presentation of the cross at the high altar. 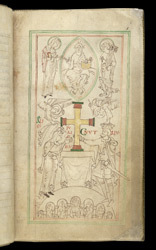 Angels hold a veil over Aelfgifu, a crown over Cnut and gesture upwards toward a picture of Christ enthroned on a rainbow (as he was to appear at his Second Coming). The Virgin and St Peter flank him. Below the feet of the king and queen, members of the community look upward from arches, a reference to the powerful chain of rulers and saints, intercessors who pray on their behalf.